One day while helping her mother clean up the attic, Jigglyusa found a treasure map of her town with a big red X. Instead of showing her mother, Jigglyusa decided to hide it for now and follow it the next morning in secret. When the next morning came, the little jigglypuff got out of bed, grabbed her allowance, the map, her backpack, her roller skates and pads. Since her mother slept in most days, it was easy for Jigglyusa to slip out of the house and skate along to the park where the map started at. 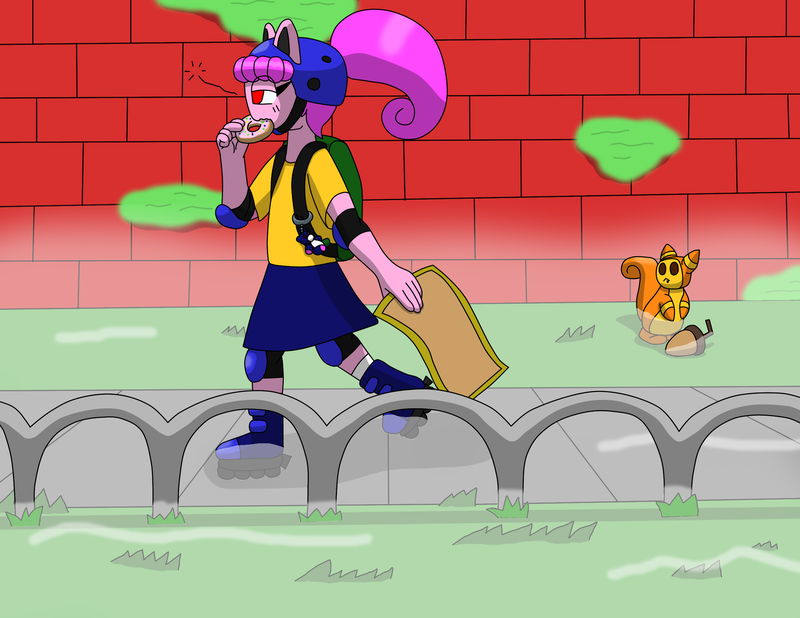 On the way, the still sleepying Jigglyusa bought herself a doughnut using her allowance and ate it as she skated along into the park where her adventure would begin. This was fun to draw, I had this calendar that I didn't use from 2014, it was filled with suggestions of things to draw each day, as an example, the fourth of july was to draw fireworks and halloween was draw trick or treaters, other days were mostly random items. I decided to take several of the suggestions to make a scene and this is what I came up with.